Knox is back. That’s no big surprise – Leslie Philips is on the cover after all. The time meddler is here for an encore, apparently all because he has fallen for the charms of Clara Harris, who will be in the theatre box when Lincoln is shot. Leslie Philips is again on top form as the dangerous charmer, setting up layers of plotting on top of each other and running rings around the Doctor and Evelyn. Knox is only half of the game, however, as becomes apparent once the body of John Wilkes Booth disappears. And suddenly Robert Ross’s last two plays link together to make sense – Knox from one, the emotion-hungry sentience at the end of the pier from the other. Given that the Sixth Doctor hasn’t really had any recurring enemies of his own (bar Sil, of course), it’s refreshing to witness him locking horns against two returning villains at the same time. There’s the supporting cast to consider too – a lot of posturing from Eric Loren as the putative lawman John Parker, and a good couple of turns from Lysette Anthony and Madeleine Potter remind us that we’re dealing with actual history here and the Doctor has to keep that on track as well as deal with Knox. Tricky to manage. Robert Ross returns to a theme that appeared in his last two plays too – that of “saving” someone from history. Daft Jamie and Mary Patterson, young Emily, and now Clara Harris – all the subjects of arguments between the Doctor and Evelyn for this purpose. Unfortunately you know how these arguments will always turn out – leave the timeline alone; don’t interfere. 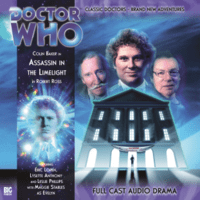 Overall, Assassin in the Limelight is better than both of Ross’s preceding plays and gives Knox and his upgraded Tardis a good send-off in the process.